Former FBI Director James Comey wrote on Twitter that he will testify privately before a House panel on the condition that he will be able to speak freely afterward and that a public transcript will be released within 24 hours. Add James Comey as an interest to stay up to date on the latest James Comey news, video, and analysis from ABC News. “Hard to protect my rights without being in contempt, which I don’t believe in. So [I] will sit in the dark, but Republicans agree I’m free to talk when done and transcript released in 24 hours. This is the closest I can get to public testimony,” Comey wrote on Twitter Sunday morning. Comey has agreed to testify on Friday behind closed doors, according to a committee aide. Comey had filed suit in federal court Thursday to block the subpoena requiring him to testify behind closed doors to the House Judiciary and Oversight Committees, instead preferring to testify publicly. In the lawsuit, the former FBI director condemned the process as being powered by “a poisonous combination of presidential tweets and the selective leaking that has become standard practice" for Republican lawmakers. Republican lawmakers want one more opportunity before handing control of the House to Democrats to push both Comey and former Attorney General Loretta Lynch on their handling of the FBI’s investigation into former Secretary of State and Democratic presidential candidate Hillary Clinton’s use of a private email server and their separate probe into Russian interference in the 2016 presidential election. "Mr. Comey asks this Court’s intervention not to avoid giving testimony but to prevent the [panel] from using the pretext of a closed interview to peddle a distorted, partisan political narrative about the Clinton and Russian investigations through selective leaks," read Comey's challenge to the subpoena, filed Thursday in U.S. District Court for the District of Columbia. Comey also expressed gratitude to U.S. Circuit Court Judge Trevor McFadden, an appointee of President Donald Trump, who was expected to make a formal ruling Monday. 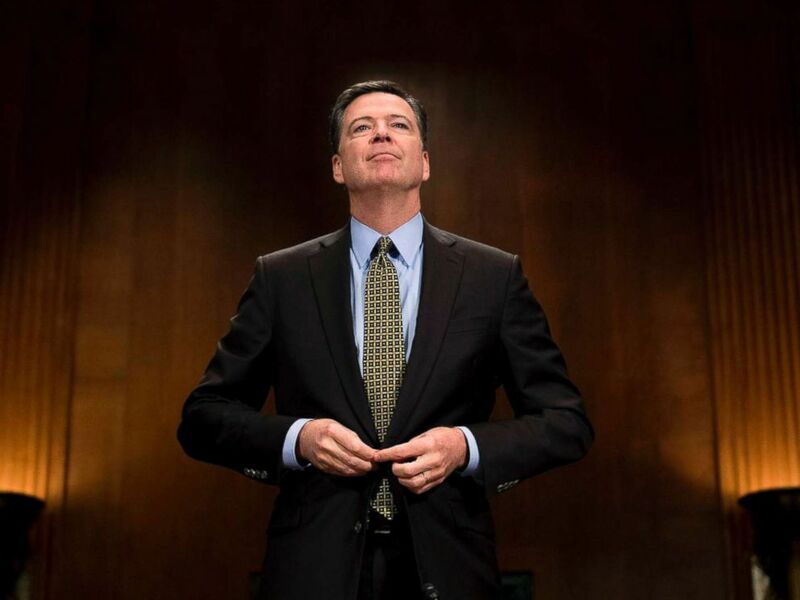 FBI Director James Comey prepares to testify on May 3, 2017 before the Senate Judiciary Committee on Capitol Hill in Washington, D.C.
“It appears Mr. Comey believes he deserves special treatment, as he is the only witness refusing to either appear voluntarily or comply with a subpoena,” Goodlatte wrote. It appears Mr. Comey believes he deserves special treatment, as he is the only witness refusing to either appear voluntarily or comply with a subpoena. He needs to appear before the Committees, as all other witnesses have done. Let the facts come to light. Comey has received a subpoena from the Republican-led House Judiciary Committee before. In 2016, after the then-FBI director announced the agency would not recommend seeking charges for Clinton’s use of a private email server. Comey has also previously testified on Capitol Hill about both the Clinton and Russia investigations. Trump fired Comey last year on the grounds that Comey had mishandled the Clinton case, with both then-Attorney General Jeff Sessions and Deputy Attorney General Rod Rosenstein sending memos expressing agreement with the decision. ABC News' Mike Levine, Ben Siegel and MaryAlice Parks contributed to this report.